GAMURS’s Week 3 edition of the power rankings for the 2016 Summer Split of the North American League Championship Series. 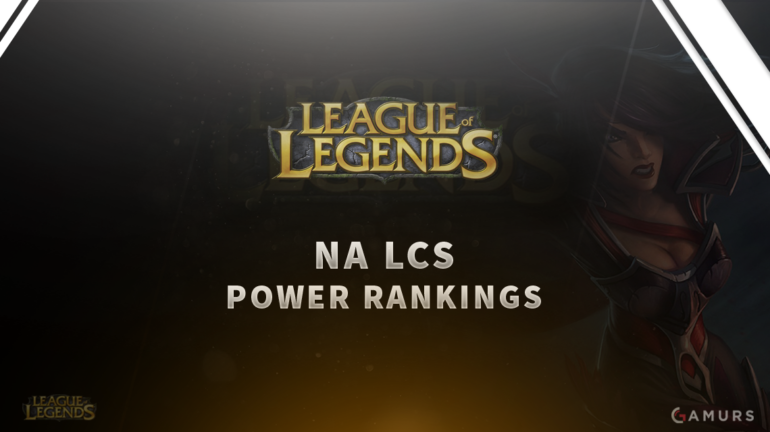 The second week of the North American League Championship Series (NA LCS) has come to a close, and with it comes an updated edition of GAMURS’s power rankings. The points for these power rankings will be calculated based on the rankings submitted by any of the GAMURS staff members. These staff members were asked to rank the 10 teams in order from best to worst, with No. 1 being the best and No. 10 being the worst. Points will be rewarded to mirror a team’s ranking; for example, the first place team will receive 10 points, while the 10th place team will receive one point. After every week of action, we will be releasing another power rankings article where the teams will either move up or down based on how they perform in their matches, so don’t forget to check back here each week for the latest power rankings. Now, without ado, here are the power rankings for the second week of the NA LCS. Our champions, TSM remain in the No. 1 spot from last week’s rankings after defeating Immortals 2-1 and Apex Gaming 2-0. This past week, TSM convincingly took down Immortals, the team many people saw as the only real threat to TSM’s crown this split. Cloud9 show up as the next major opponent, so TSM will yet again be put to the test against one of the best teams in North America. Right now, though, they have proven that they are the team to beat. After defeating NRG eSports 2-1 and falling to TSM by the same scoreline, Immortals remain at No. 2 in our rankings. This week basically went as most people expected for Immortals. The win over NRG was nothing surprising, and the loss to TSM is certainly nothing for them to be ashamed by. Immortals look like the No. 2 team right now, and it doesn’t seem like anyone will be taking that away from them anytime soon. Yes, they still haven’t lost a series. EnVyUs took down Apex 2-1 and Phoenix1 2-0 this past week to make their record a perfect 4-0. Where did these guys come from? Sure, in week one they took down NRG and Team Liquid, but to go 2-0 again this week was impressive. Going into the match against Apex, it was a battle between two of the league’s undefeated, and EnVyUs won it convincingly, the decimated Phoenix1 later that weekend. This week, they face a tougher task than before: Immortals and Counter Logic Gaming. Are they No. 1 material? One of our editors, Justin Binkowski sure thinks so, and winning these two series could help EnVyUs make that leap. Cloud9 went 2-0 this week, taking down Phoenix1 2-1 and CLG 2-0, yet they fell in our rankings. Here’s the thing: Cloud9 is a very good team. No one is doubting that now. Why did they fall? EnVyUs look even better. Cloud9 did not really help themselves by dropping a game to bottom-dwellers Phoenix1 either. Still, we all know how talented this squad is. This week we will see them pushed to their limits when they take on league-leading TSM. Despite an 0-2 week that included being defeated 2-1 by EnVyUs and 2-0 by TSM, Apex remain in the No. 5 spot in our rankings. The team never looked particularly bad, they just faced extremely tough opponents and relied completely on Ray to carry them to their wins. The man is good, but carrying a game against TSM is a level that hardly any player can hit. Apex will look to redeem themselves this week against Phoenix1 and Cloud9. Oh how the mighty have fallen. CLG earned its first win of the plst this week by defeating Liquid 2-1, but were swiftly dismantled 2-0 by Cloud9 later in the weekend. Last split’s champions still have not adapted to the new meta, and it’s hurting them. Just like last week, there’s nothing particularly wrong with this team, well nothing on the surface at least. Maybe there are issues on the inside, maybe they lack motivation now that they are not considered the scrappy underdogs, or maybe they still just have not adapted to the meta. Whatever the problem is, CLG needs to fix it before things get any worse. NRG looked bad in week one, very bad. Week two, however, showed the team’s potential as they fell 2-1 to Immortals and defeated Echo Fox 2-0. I’ll be the first to admit that we were quick to judge this NRG lineup. They haven’t had time to synergize or really become a team yet, and that is what we saw week one. Week two was a different squad. Taking a game off of Immortals is something to celebrate, especially considering last week’s performance and how little time this team has been together. Defeating Echo Fox 2-0 would have been impressive, but that squad is struggling. We’ll get to them in a second. All in all, NRG has potential and can only get better from here. This week, Liquid fell 2-1 to CLG and defeated a struggling Echo Fox squad 2-0. It’s hard to gauge this team’s improvement based on their week two opponents. CLG is not the same CLG we all loved (or hated) last split, and Echo Fox seemingly regressed over the offseason. Taking a map off of CLG was good, and defeating Echo Fox 2-0 was too, but it’s still hard to say if this team is back at the level they were last split. Week two saw Echo Fox fall 2-0 to both Liquid and NRG. It was not a pretty sight. This roster was improving every week last split once they got together and their offseason was highly productive, especially for Keith, so just what is happening here? The synergy doesn’t look like it’s there, and the individual play isn’t all too impressive either. Keith’s offseason consisted of him becoming one of the highest ranked players in the Korean solo queue ladder, a feat not to be ignored, but he has seemingly been absent in many of Echo Fox’s games so far this split. Remaining in last place in our rankings and in the real standings, Phoenix1 fell 2-1 to Cloud9 and 2-0 to Team EnVyUs. Taking Cloud9 to a third game was surprising, and good for Phoenix1, but it doesn’t change another 0-2 week. Phoenix1 once again faced two tough opponents favored to beat them, and it happened. Next week they face two slightly easier opponents in Liquid and Apex, but no one should expect any different results unless this team just kicks it into overdrive. What do you think about our Power Rankings for this week? Are there any teams that you would rank higher or lower? Let us know by commenting below or tweeting us @GAMURScom. Spencer Hester can be contacted by email at Hester.eSports@gmail.com or on Twitter – @SpenceGAMURS.